New unit was designed by engineer behind classic Memory Man and Echolution pedals. 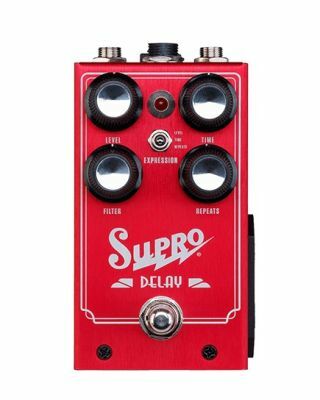 Supro has announced its new Delay, an all-analog echo pedal that uses a pair of new-production MN3005 “bucket brigade” IC chips to deliver sounds ranging from 20ms slapback up to 600ms of vintage delay. According to the company, the unit offers dramatically increased headroom and dynamic range courtesy of robust 15V power rails. Controls on the Delay include Time, Repeats, Level and Filter, the last of which offers both low-pass and band-pass functions on a single knob, providing the dark and murky echoes associated with BBD analog delays as well as bright tape echo sounds that evolve over time with extended repeats. There’s also an Expression input, which can be assigned to control of the Time, Repeats or Level knobs using a standard TRS expression pedal, as well as soft-touch, click-free, true bypass switching and internally switchable Dry Kill and Trails functions. For more information, head over to suprousa.com.